Hello, and happy almost weekend! 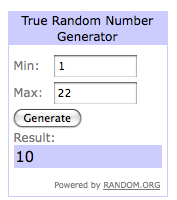 Two giveaways were running this week, and today I pick the winners. Congrats, and thanks to everyone who entered! I'll be contacting you for your shipping info. Stay tuned. Next week I decide which recipe to use as my final post, which you guys will vote for to hopefully help me win! The first 500 voters receive a free sample of lentils. I'll let you know more about that then, too. Thank you very much! I'm going to love baking on this sheet!